Boston's annual St. Patrick's Day Breakfast and Parade will go on as scheduled. The annual St. Patrick’s Day Parade in South Boston will go on and on the scheduled date of March 15, and the route will not move out of Southie. Parade organizers and Boston’s mayor met Monday after concerns were raised that the traditional route through the side streets would have to be changed. Too much snow could make it too difficult for people marching to make it through the streets. The mayor last week even raised the possibility that the parade could move downtown, but that’s now off the table. 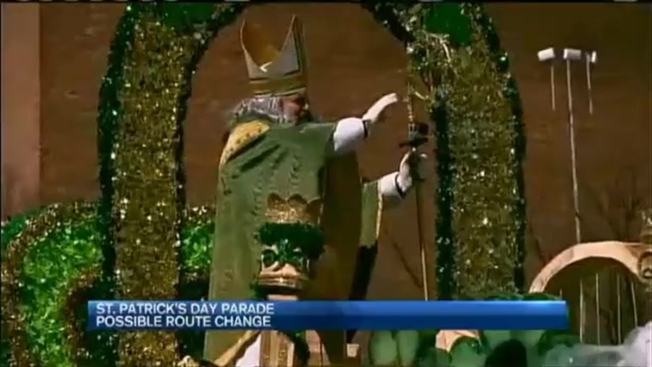 Parade organizers were dead set on keeping the traditional route and on the 15. There are too many people marching who have committed to the date, and organizers did not want to delay it until more snow melted. “They all have hotel rooms,” said parade organizer Brian Mahoney. “We can’t say come back in a couple of weeks." Boston St. Patrick's Day Parade in Jeopardy? After Monday’s meeting, both sides say the parade will remain in South Boston, with some tweaks to the route. Parade organizers will present the different proposed routes to the full committee on Tuesday. The route typically heads down Broadway and makes a handful of turns onto smaller streets like G, K and P streets.